Available as a digital book only: The US economy has disintegrated, and with it into the abyss plummet the blueprints of neoliberal economists, whose theories about “the free market” have now gone the way of medieval alchemy. 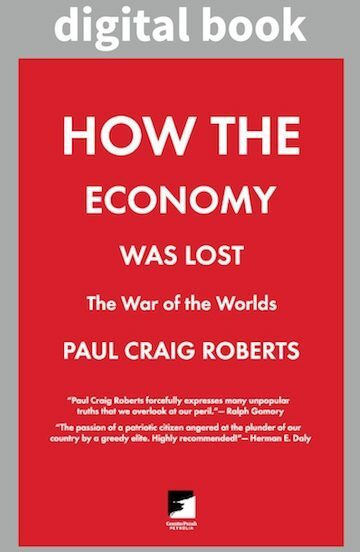 No voice has been stronger, no prose more forceful, than that of Paul Craig Roberts in predicting collapse. His weekly columns in CounterPunch have won an audience of millions around the world, grateful for a trained economist who can explain lucidly how the well-being of the planet has been held hostage by the gangster elite. Now Dr. Roberts has written the shortest, sharpest outline of economics for the twenty-first century ever put between book covers. He traces the path to ruin and lays out the choices that must be made. There is the “empty world” of corporate exploitation, abetted by the vast majority of economists; or the “full world” of responsible management and distribution of our resources. Amid crisis, this is the guide you’ve been waiting for. PDF is emailed within 48 hours of purchase, and sooner on weekdays. Published by CounterPunch and AK Press 2010. 263 Pages. A link to this digital book in pdf format will be provided with your order confirmation and will also appear in your order confirmation email.